Joe Pinella, center, teaches his "healing movement Qi Gong and Tai Chi" class to participants at SaddleBrooke One, 64500 E. Saddlebrooke Blvd., on Thursday, Dec. 18, 2014, near Oro Valley, Ariz. Pinella, 66, is now out of a wheelchair after an accident 25 years ago left him quadriplegic. 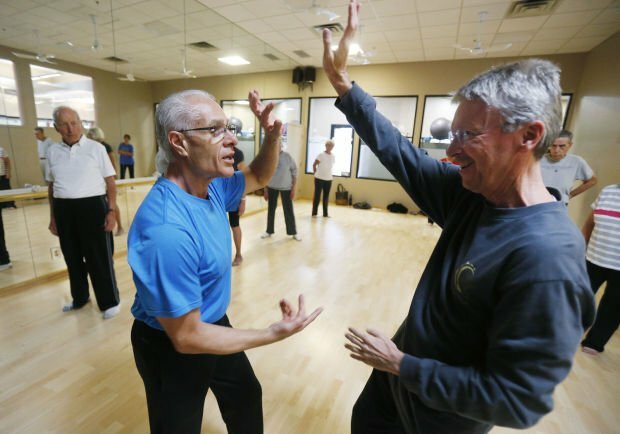 Joe Pinella, left, shows the martial arts root of the “dragon” move with Rick Baumgartner as he teaches his “healing movement Qi Gong and Tai Chi” class to participants at SaddleBrooke One, 64500 E. Saddlebrooke Blvd., on Thursday, Dec. 18, 2014, near Oro Valley, Ariz. Pinella, 66, is now out of a wheelchair after an accident 25 years ago left him quadriplegic. Joe Pinella smiles as he teaches his “healing movement Qi Gong and Tai Chi” class to participants at SaddleBrooke One, 64500 E. Saddlebrooke Blvd., on Thursday, Dec. 18, 2014, near Oro Valley, Ariz. Pinella, 66, is now out of a wheelchair after an accident 25 years ago left him quadriplegic. Joe Pinella remembers that horrific day in June 1991. He remembers driving on I-40 outside of Flagstaff, his Bronco pulling his Ferrari as he headed to New Jersey to celebrate his birthday with friends. He remembers the trailer hitch coming undone and smashing into his car and pushing it down a ravine. He remembers flying through the windshield. He remembers the EMT who had been riding in the truck behind him rushing down that ravine and asking him if he could move. His neck was broken; his head had shifted about three inches over his shoulder. He couldn’t move. Pinella, then a semiretired entrepreneur with plans for an active life, was indeed a quadriplegic. Two vertebrae had shattered into 150 pieces. Four discs in his spine were gone; the rest were herniated. It was an injury similar to the one that crippled the late actor Christopher Reeve. “He had a devastating injury,” said Dr. Donald Hales, the neck specialist who happened to be on duty at the Flagstaff Medical Center that June day. Pinella was told that he would spend the rest of his life in a wheelchair. He needed to learn to accept that. He couldn’t. Today, Pinella, 66 and an Oro Valley resident, walks without any aid, stands straight and without pain, takes no medications, and teaches tai chi and qigong five times a week. This weekend he will perform in Dancing in the Street’s “The Nutcracker Ballet” — something he has done for four years. This is the story of how Joe Pinella learned to walk again, to brush his teeth, eat on his own, and live an active life free of wheelchairs, walkers, a cane, or even medications. “There were a whole list of little miracles that day,” Pinella said on a recent Monday shortly before he was to teach a tai chi class. Even with that fast, good attention, Pinella wasn’t expected to make it through intact. He knows this because as the doctors furiously scrambled to save him, he found himself floating above them, watching as they worked on him, listening as they talked. “I heard the doctor say ‘This is about saving his life; he’s going to be a quad,’” said Pinella, who had owned a body shop specializing in Ferraris. Pinella is a bit uncomfortable talking about the experience. “It sounds so New Agey,” he said. But it happened — Hales was incredulous when Pinella was able to relay back to him what was said and done. And that experience was at the root of his determination to get back to his old self. “That’s what gave me the confidence,” Pinella said. After spending about a month in the Flagstaff hospital, Pinella was sent home to Scottsdale, confined to a wheelchair and prescribed physical therapy. “Having that knowing that I would be OK, I thought physical therapy would help me do that,” he said. At that point, Pinella could do nothing for himself. He had no control over his hands or his legs. He wore a neck-to-waist brace 24/7. He went to physical therapy with the goal of eventually caring for himself, walking free of any aids. “But their whole attitude was to make me accept that I would have to live the way I was,” said Pinella. Depression and frustration spent plenty of time with Pinella — not unusual with those who have his kinds of injuries, said Hales from his Flagstaff office. He had constant care. He needed someone to bathe him, brush his teeth, feed him. “It would have been easy to still be in a wheelchair,” said Pinella, now sitting on the carpeted floor of his Oro Valley living room, his shoes off and his hands gracefully punctuating his words. He often questioned his resolve. After about eight weeks of physical therapy, Pinella quit in disgust that their goal was not the same as his: to walk and care for himself again. “We were at war,” he said of he and his physical therapist. In despair, he reached back to his teen years, when he had studied tai chi and qigong with a master in New York. He called him and, through a Chinese interpreter, asked advice. He told Pinella to do qigong, an ancient Chinese practice that is intended to put the breath, body and mind in alignment. He spent three hours every morning and three every afternoon visualizing while sitting in a hot tub. He rarely opened his eyes when he was in the hot tub because he didn’t want to break his concentration. Once, after about eight months of the exercises, he allowed himself one of those peeks. This time, it wasn’t in his head — his hands really were moving. “When I was able to control my hands, I knew it would work,” he said. It wasn’t a fast recovery from there. Pinella had to learn the most basic things all over. But slowly he regained the use of his body. He continued the exercises on a daily basis. After about seven years, Pinella was back to the way he was, with the exception of two fingers on his left hand — he can’t move them. His surgeon in Flagstaff, Dr. Hales, admits that Pinella’s case is unusual. But Hales is not surprised that Pinella was able to do it. 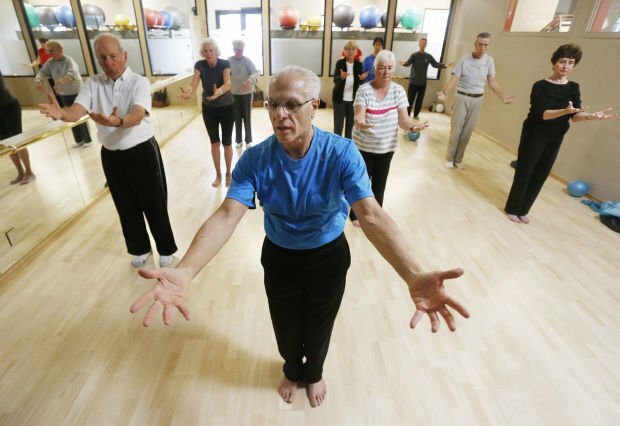 That outcome includes teaching tai chi and qigong — the slow, gentle exercises that brought him back to health — to about 2,000 people a year, mostly seniors. It is not unusual for his students to come back to him and marvel at how their arthritis no longer prevents them from squatting or turning their necks. “I don’t want anybody to think I do anything,” Pinella said about his grateful students. As for his own astonishing recovery, he credits those exercises. Joe Pinella performs in Dancing in the Streets, Arizona “The Nutcracker Ballet” at 7 p.m. Saturday and 3 p.m. Sunday at The Temple of Music and Art, 330 S. Scott Ave. Tickets are $13-$40 and are available at the door. Joe Pinella teaches open-to-the-public Tai Chi classes are at 10 a.m. Saturdays at The Highlands at Dove Mountain, 4949 W. Heritage Club Blvd., and 7 p.m. Mondays at Dancing in the Streets, Arizona, 88 W. 38th St. The Dancing in the Streets, Arizona classes are in session when the dance school is, so call first: 867-8489. Classes at both places are $10 each. The Rogue Theatre and Artifact Dance Project join forces to perform three Oscar Wilde short stories. Two studios now offer the classes, which use a silky hammock to intensify exercises. There’s much to keep theater lovers entertained over the next week: Comedies, musicals, and even a revival of old-time radio shows. Roadrunner hams it up with "I Hate Hamlet"